Inclusion is primarily discussed in education. With the increasing number of member states of the United Nations ratifying the Convention on the Rights of Persons with Disabilities, academics have vividly discussed inclusion in the context of other areas of life, such as the community at large, as ‘social inclusion’ in the context of work and employment, and with regard to the aspects addressed by Article 30.5 of the Convention, namely cultural life, recreation, leisure, and sport. 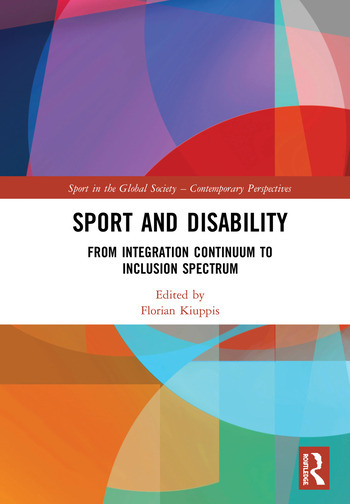 This volume is organized around the topic inclusion in sport and has a particular focus on the participation of people with disabilities in sport. Typical barriers for people with disabilities to participate in sport include lack of awareness on the part of people without disabilities as to how to involve them in teams adequately; lack of opportunities and programmes for training and competition; too few accessible facilities due to physical barriers; and limited information on and access to resources. The chapters attribute central importance to the processes and mechanisms of inclusion that operate within sporting environments and to the question of either what happens or could happen to persons with disabilities who enter the playing field. The chapters were originally published in a special issue of Sport in Society. 7. Sense of belonging: is inclusion the answer? Florian Kiuppis, formerly Chairholder of UNESCO Chair in Inclusive Physical Education, Sport, Fitness and Recreation at the Institute of Technology, Tralee (Ireland) and currently Professor of Inclusive Education at the Catholic University of Applied Sciences Freiburg (Germany) and Inland University of Applied Sciences – INN University, Lillehammer (Norway).